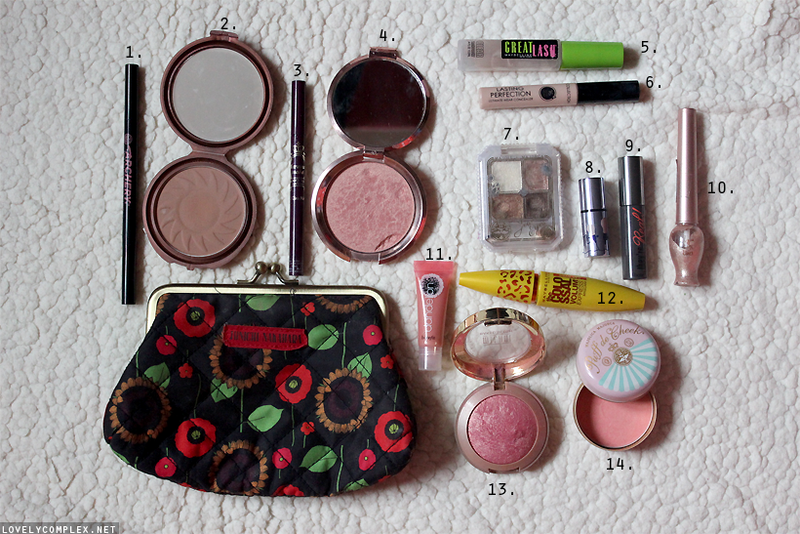 Recently, I received a few requests to show what’s inside my makeup bag! I haven’t done one of these posts in a really long time so I figured now would be a good time to do an updated version! Also included a mini commentary/review thing…? The makeup bag itself is a pouch by Junichi Nakahara. It came as a gift with a magazine. I love it! So cute. 1. Soap and Glory Brow Archery in Brownie Points – has a gel brush side and a crayon side, basically saved my horrible eyebrows. 3. Kiss Me Heroine Make Smooth Liquid Eyeliner in black – favourite liquid eyeliner! 4. 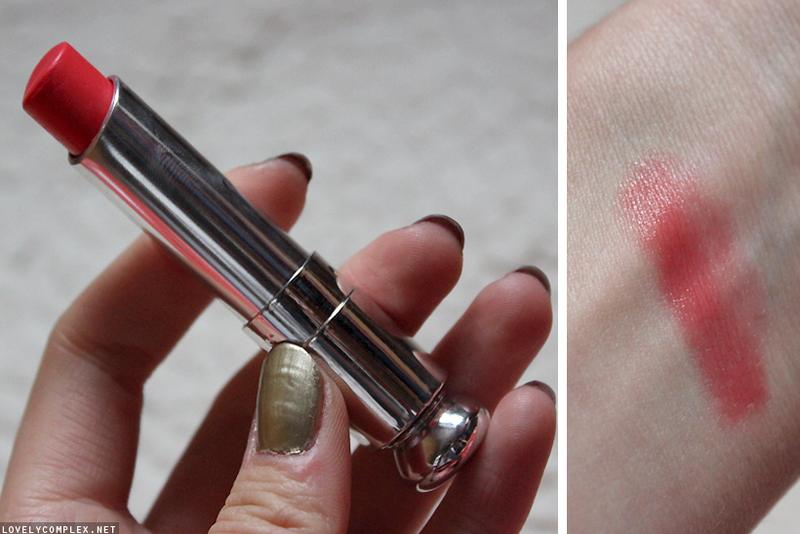 Elizabeth Arden Pure Finish Illuminator in Rose Illumination – found this baby for a total steal in Winners! Lovely rose gold highlighter. 5. Maybelline Great Lash clear mascara – used as a brow gel to hold everything in place! 6. Collection 2000 Lasting Perfection concealer in light – tried this because UK beauty bloggers rave about it. Super creamy + fantastice coverage. 7. Majolica Majorca Jeweling Eyes eyeshadow quad – perfect mix of neutral colours! 9. Benefit They’re Real Mascara (deluxe sample size) – Came with the Watts Up. Best mascara I’ve tried, tempted to get full size. 10. Etude House Tear Drop Liner in Sun Light – great for a boost of shimmer along the eyes. 11. Benefit Dandelion lip gloss – ok lipgloss, light peachy pink, was a magazine sample. 12. Maybelline Colossal Cat Eyes Mascara – kinda crap, doesn’t really do anything for me. Just trying to finish it so I can get a different one. 13. Milani Baked Blush in Rose D’Oro – Very pretty shimmery blush+highlighter. Lovely rose gold. 14. 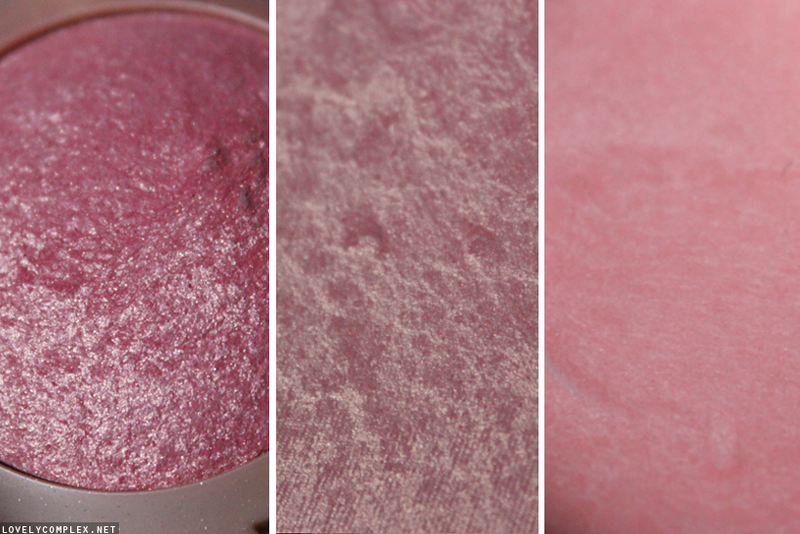 Majolica Majorca Puff de Cheek tin blush in Peach – pretty matte peach colour! I usually only have 1 of these in my makeup bag, but for some reason they were all crammed in there so I decided to include them haha. 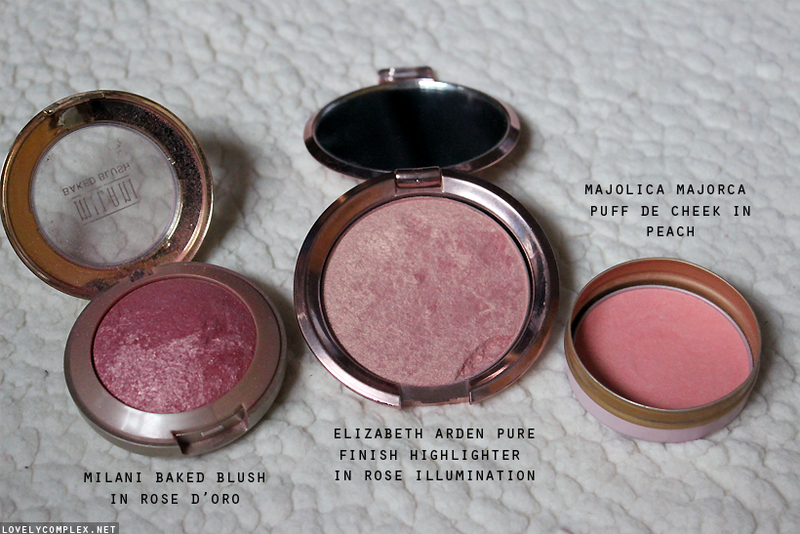 my go-to for the spring/summer is the peach blush, whereas I’m using the Milani rosegold blush more in fall/winter! I don’t really carry the Elizabeth Arden highlighter too often, I usually just bring it because I like the mirror. This is my everyday lipstick! It’s an semi-sheer orange-red lipstick. I love it! If there are any items you’d like a review on that I haven’t already done a review/swatches for, please let me know in the comments!